Slow Bone set to open "soon"
According to the Dallas Observer, Jack Perkin's Slow Bone BBQ is set to open Tuesday, April 16. 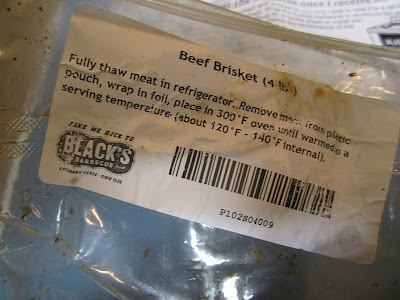 After my last few trips through Lockhart our freezer has been stuffed with goodness from Kreuz, Black's, and Franklin. 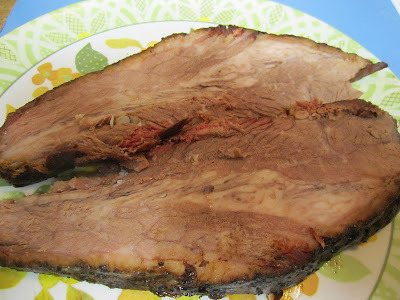 We finally got it whittled down a bit (after a lot of good eating) and I just got around to thawing out a 4 pound hunk of brisket from Black's. One thing I loved about this package is it was mostly uncut brisket, so all the moisture was retained inside. 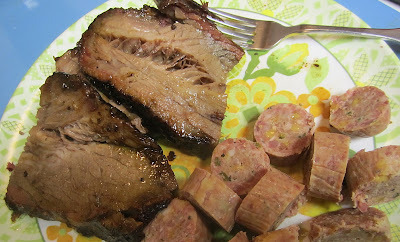 I chopped off a couple of cold slices to have with some Kreuz jalapeno cheese sausage last night and here's what I saw. After about 90 seconds in the microwave, I had these beautiful moist half-slices which were full of smoke flavor. You could have cut these with a plastic fork. Click on the photo below to see that meat! Can you say perfectly rendered melt in your mouth fat? Yow! Black's has handy heating instructions on their package, but I think a short zap in the microwave in a covered bowl does just as well. Life is sure good, but I do think we need a bigger freezer.